TAST stitch 114 and 115 are variations with long tail chain stitches: plain, beaded and whipped. TAST stands for Take A Stitch Tuesday, an embroidery challenge at Pin Tangle. Today I want to share a few of my old samples of the long tail chain stitch. Here I used it to decorate a border with fancy hem stitch and slipped detached chain stitch. 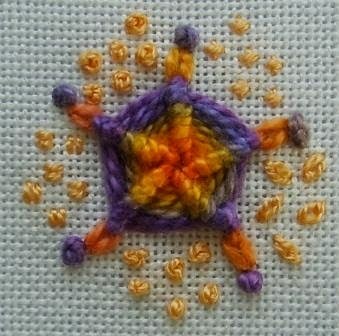 This is part of my lock stitch sampler for TAST 2010. I used the long tailed chain stitch instead of straight stitch and tied them with lock stitch to make some pretty bouquets. Here I used long tailed chain stitch as a base for my cloud filling, I laced both parts of the stitch with different threads. 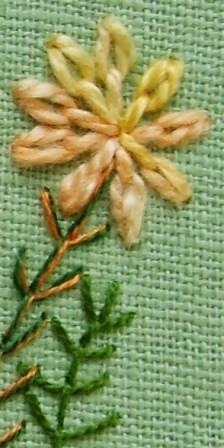 This flower is part of my floral sampler. A whipped wheel with long tail chain stitches in Stef Francis perle 5. My last sample is another whipped wheel, this time I used perle 8 on felt. It’s surrounded by Ermine stitches. Just click the photos to take a closer look at my samplers. You make such WONDERFUL work and combine stitches so they enhance each other. My favourite this time is the cloud filling. Thank you, Queenie. I always have fun experimenting with stitches. your imagination and talent takes you to such a creative place and transforms these stitches into beauties. Thank you, Margaret. 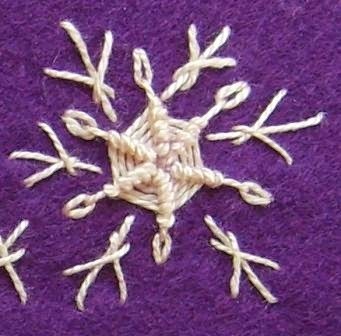 It's always a pleasure to see a stitch combo come to life with needle and thread. Very cool variations, Annet. So creative. Thank you, Suz. 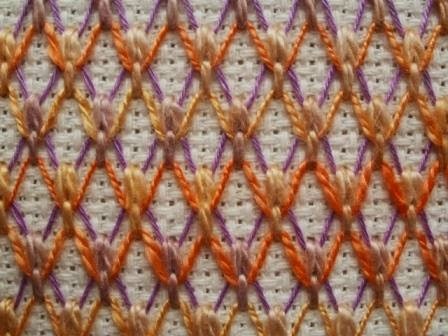 It just a nice stitch for experimenting. I had to revisit to look at your Ermine Stitch. Perfect for this season and the white stuff that is falling from the sky in winter. I'm looking forward to see what you do with Ermine stitch.